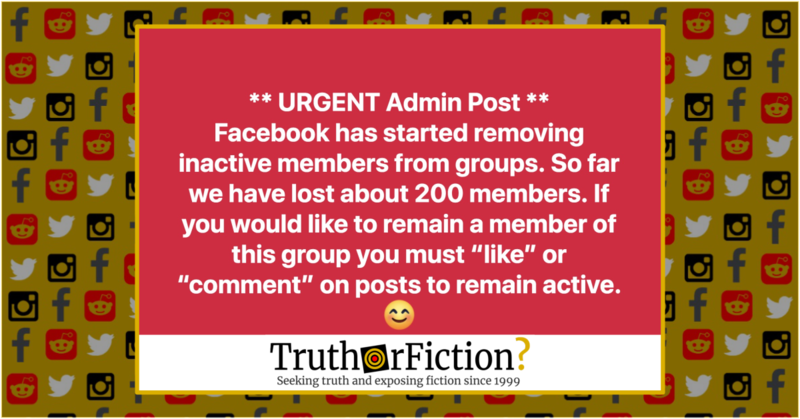 Is Facebook Removing Inactive Members from Groups? - Truth or Fiction? Facebook isn’t deleting inactive members from groups, but it is making changes to how group invitations affect member counts. 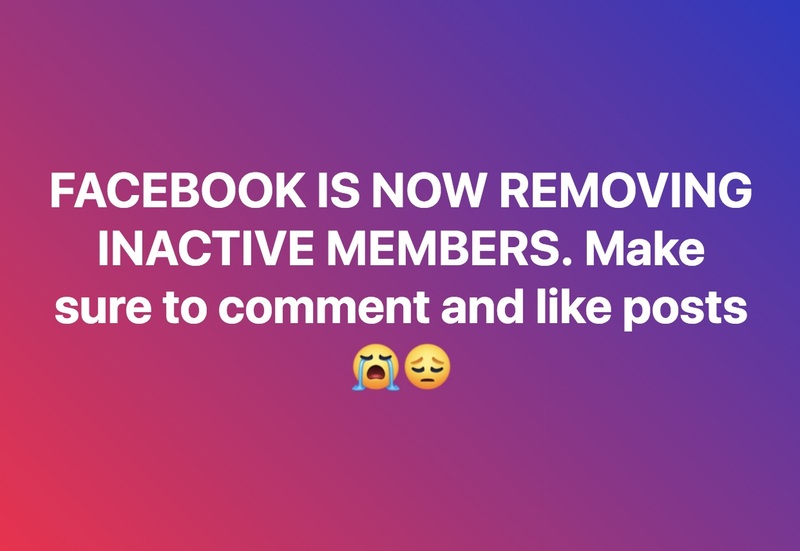 Facebook is removing inactive members from groups in January 2019. Although wording varied (sometimes including a deadline of 28 days), the general content of the inactive group users purge warning was fairly consistent. Group administrators claimed that their group or others experienced the removal of inactive members on or around January 18 2019, and that in order to stay in the group, members should interact with the warning post or other posts to confirm that they were indeed actively a part of the group. While the messages are in response to a genuine update by Facebook, most are inaccurate or misleading. Facebook is not removing inactive members of Facebook groups, but it is changing how Facebook users are invited to groups, which may result in group admins noticing a drop in their group’s member count. However the above message is inaccurate. As we stated, Facebook is changing the way people are invited to groups. Previously, Facebook users could automatically invite their friends to be a member of a group, and that member would automatically be added to the group without having to accept the invitation. Per the email from Facebook, inactive members were not being removed from groups per se. But functionality which automatically added members to group counts without their explicit permission was changing. Moreover, people who had been invited to but had not yet visited the group would be moved from the member section to a section called “Invited,” removing them from the group’s member count (of which they were previously a part). Finally, functionality to interact with “Invited” section semi-members of Facebook groups was being added to administrator functionality. Group member counts would drop due to the changes, which pertained not to “inactive” members, but to users who had been invited or added to the group but had not yet interacted with it. In a sense, those users could be described as inactive, but that descriptor suggested once-active members of groups would be removed — which did not appear to be the case. It is true that groups were likely to experience member count drops due to the change, but it involved only members who were added or invited to a group they had not yet actively opted in to join. Does Facebook delete members from a group who are inactive? Did Texas Ranchers Find ‘Prayer Rugs’ Near the U.S.-Mexico Border? Did the President Tweet in Support of a Covington Catholic Student?